Fascinating early map of India. 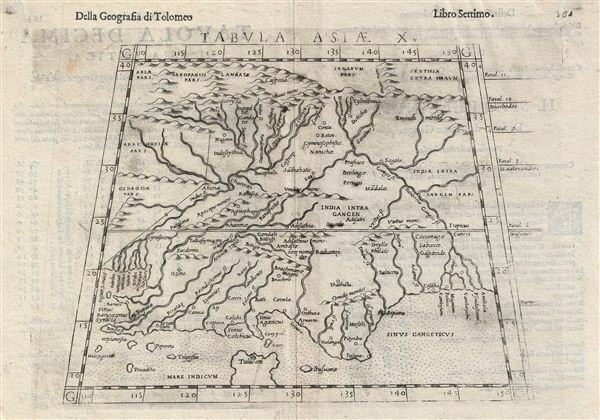 This is an uncommon 1588 Ptolemaic map of India issued for Girolamo Ruscelli's Italian edition of the Geografia di Tolomeo. Cartographically Ruscelli based this map on interpretations of Claudius Ptolemy's Geographica by Bernard Sylvanus and Sebastian Munster. The map covers the regions between the Indus River valley and the Ganges and from the Himalayas. Though somewhat difficult to understand at first glance, this map corresponds to many actual locations and is upon close examination yields some of its secrets. The Indus Valley is readily identifiable in the west as is the Ganges River Valley bounding the east. The Himalayas crown the northern parts of the map and, at the southern extension, we can identify the Indian Ocean (Mare Indicum) and the island city of Talacori - an ancient Ptolemaic reference to the northern tip Ceylon. The subcontinent itself is barely discernible. The island between Talacori (Ceylon) labeled Cory and the strange peninsula between the Sinus Colcicus and Sinus Agaricus that separates the important ancient world maritime trading cities of Colchi and Aruarni can only be a primitive mapping of Rama's Bridge (Adam's Bridge), the limestone ridge separating India from Ceylon. Further east, in the Sinus Gangeticus or Bay of Bengal, the greatest city is Sipara, an early name for modern day Narsapur. The interior is unbelievably confusing. At center some of associated the city of Adisathra with the modern day city of Chattisgarh. The Orudij Montes, also known as the Oroudian Mountains, are possibly the Western Ghats. However, this is uncertain and though volumes have been written on the subject Ptolemaic India, especially in the 19th century, no clear consensus has been formed. A fine, collectable, and early piece essential for any serious collection focused on the cartographic emergence of India in european maps. Published in Girolamo Ruscelli's Italian edition of the Geografia di Tolomeo. Girolamo Ruscelli (1500 - 1566) was an Italian polymath, humanist, editor, and cartographer active in Venice during the early 16th century. Born in Viterbo, Ruscelli lived in Aquileia, Padua, Rome and Naples before relocating to Vencie, where he spent much of his life. Cartographically, Ruscelli is best known for his important revision of Ptolemy's Geographia, which was published posthumously in 1574. Ruscelli, basing his work on Gastaldi's 1548 expansion of Ptolemy, added some 37 new "Ptolemaic" maps to his Italian translation of the Geographia. Ruscelli is also listed as the editor to such important works as Boccaccio's Decameron, Petrarch's verse, Ariosto's Orlando Furioso, and various other works. In addition to his well-known cartographic work many scholars associate Ruscelli with Alexius Pedemontanus, author of the popular De' Secreti del R. D. Alessio Piemontese. This well-known work, or "Book of Secrets" was a compilation of scientific and quasi-scientific medical recipes, household advice, and technical commentary on a range of topics that included metallurgy, alchemy, dyeing, perfume making. Ruscelli, as Alexius, founded a "Academy of Secrets," a group of noblemen and humanists dedicated to unearthing "forbidden" scientific knowledge. This was the first known experimental scientific society and was later imitated by a number of other groups throughout Europe, including the Accademia dei Secreti of Naples. Ruscelli, G., Geografia di Tolomeo, (Venice) 1588. Very good. Text on verso. Some repairs wormholes in upper margins. Original centerfold. Original platemark visible. Overall a very nice crisp example. Nordenskiold, A. E., Facsimile-Atlas to the Early History of Cartography with Reproductions of the Most Important Maps Printed in the XV and XVI Centuries, 227. Shirley R., Maps in the Atlases of the British Library, T.Ptol-10f.